In this tutorial, we're going to learn how to use the Rectangular and Elliptical Marquee tools. 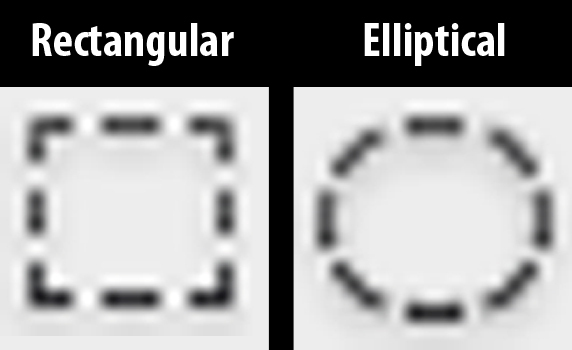 These tools allow you to make rectangular and elliptical selections, respectively. 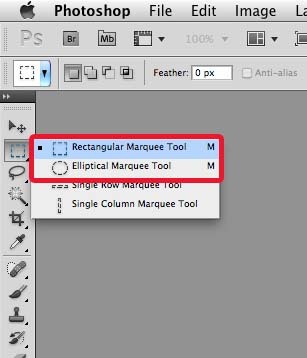 The Rectangular and Elliptical Marquee tools can be found in the toolbar. Selections allow you to isolate a portion of a layer so that anything outside of the selection will get protected from being edited. Let's first learn how to make a selection. This short video demonstrates how to make a selection using the Rectangular Marquee tool. The same concept applies when you use the Elliptical Marquee. Hold down the SHIFT key to make perfectly shaped square or circle selections using the Rectangular or Elliptical Marquee tools, respectively. After you've made an initial selection, you can continue to add to the selection by holding down the SHIFT key. In the previous video, the SHIFT key was being held down while the initial selection was being made. This results in a symmetrical selection. In this instance, the selection is completed first so the mouse has already been released. And then subsequent selections are made while holding down the SHIFT key. This will result in the subsequent selections being added to the original selection. If you wish to subtract portions of an existing selection, use the ALT key modifier. To remove an existing selection, go to the menu bar and choose Select > Deselect. You can also use the keyboard shortcut ctrl + D (PC) or cmd + D (Mac).